The HotPot: the natural way to cook! Through field experience and research, SHE perceived the need for a mass-produced solar oven that was durable, efficient, easy-to-use, portable and commercially viable. After years of research the HotPotTM design was completed in 2004. It evolved from the “panel” oven invented by Dr. Roger Bernard and refined by Solar Cookers International. The science and engineering were accomplished by the Florida Solar Energy Center. 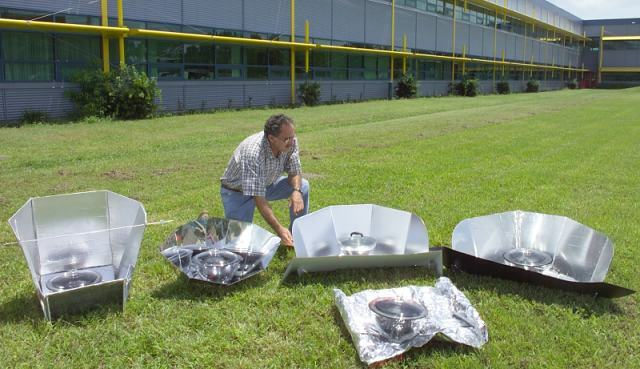 The reflector was designed by Glen Newman of Energy Laboratories, Inc., Jacksonville, Florida. In 2006 tests to re-evaluate the capacity of the HotPot to effectively heat water and food were performed in Burkina Faso, The Gambia and Senegal and confirm again that the HotPot is an effective and efficient solar cooker. The HotPot is manufactured in Mexico by a private business, in cooperation with the Mexican Nature Conservation Fund, a non-profit. The U.S. distributor for the HotPot is Sun BD Corporation. SHE Inc. becomes involved in large quantity HotPot purchases to be used in solar cooking technology transfer projects. I cook chickens perfectly in my HotPot! This en-courages me to try cooking other dishes. We have a lot of sun in Oaxaca, and should take advantage of it! We must teach people how to solar cook rather than use a lot of fuel wood. Demonstration of the HotPot solar cooker cooking frijoles. This features the cardboard reflector.